San Diego native and multi-instrumentalist Doug Robinson has already managed to leave his mark on both the local and international music scenes. In the early ‘70s, he simultaneously drummed for the award-winning Crawford High School Jazz Ensemble alongside bassist Nathan East, pianist Carl Evans Jr. and the late saxophonist Hollis Gentry lll while he played piano and organ for his prog/rock group, The Twinkies. He went on to apprentice bebop trombone legend Frank Rehak and studied piano and harmony with Al Bauman, writing arrangements in different musical styles each week and performing at jazz festivals as the bassist for the historical jazz group known as The Sounds of Synanon. 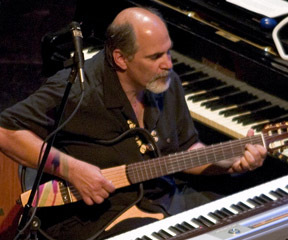 As a composer, arranger and producer, Doug has since released 14 eclectic albums on Act As If Music, his independent label, featuring jazz greats like guitarist Mike Stern and drummer Peter Erskine as well as his local trio, JAZZOOO (with Duncan Moore and Ken Dow). Doug and his brother Andy grew up in a home where music constantly filled the air: their father was always bringing home new 45rpm recordings to test out for the juke boxes in his downtown bars. Absorbing everything from Marty Robbins to Frank Zappa, he has never felt limited by stylistic boundaries and today Doug can play in multiple styles with true artistic conviction.